September 15th and 16th is Mexico’s Independence Day when Mexicans celebrate their patriotism and national identity. As part of the celebration the Mexican President steps onto the balcony of the National Palace on the Zócalo, the central square of the capital, rings a bell as Miguel Hidalgo did when announcing the insurrection which began the war of independence 203 years ago and shouts “Viva Mexico” three times. This year was the first year for the newly elected president from the Institutional Revolutionary Party (PRI), Enrique Peña Nieto, to perform this ceremony. But for several weeks leading up to Independence Day the Zócalo had been occupied by members of the dissident teachers’ union, the CNTE, who were protesting Peña Nieto’s Education Reform Law, which not only threatens the influence of the powerful teachers’ union but also institutes a Standard Test for all teachers and even liquidates the State Teacher’s schools. The dissident teachers were occupying the square with bed rolls and blankets under plastic tarps in what has been unusually rainy weather. 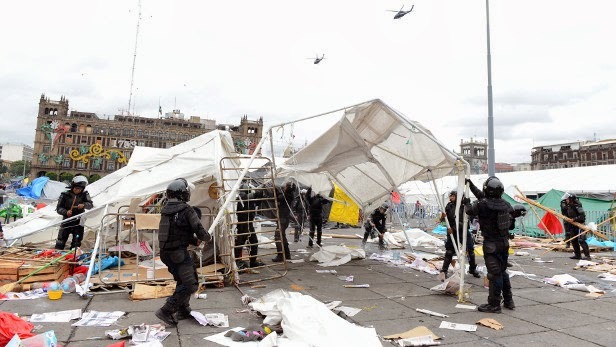 No demonstration in the last few years has managed to disrupt the venue of the important independence ceremony, at least since Andrés Manuel Lopez Obrador (AMLO) and his supporters occupied the Zócalo in 2006 to protest the fraudulent presidential elections which deprived AMLO of victory in favor of the candidate from the National Action Party (PAN), Felipe Calderon. The sitting president at that time, Vicente Fox, also of the PAN, was forced to give the ceremonial “ grito” in Guanajuato. 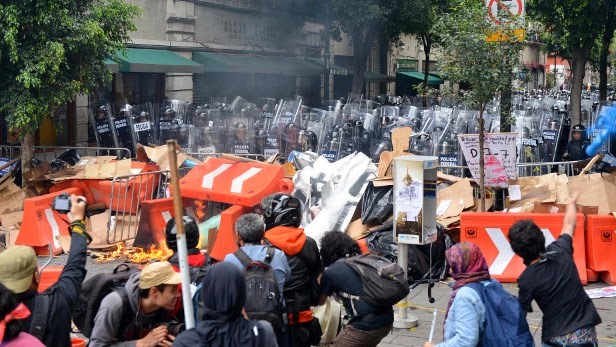 The teachers who oppose the Education Reform had been trying to negotiate their withdrawal from the central square with Peña Nieto before the Independence Day celebration, but the teachers complained that the president was intransigent and was seeking to impose the Education Law upon the teachers without consultation or compromise. On Thursday, September 12th, the teachers’ union deliberated what to do next. On the morning of Friday the 13th, some teachers were already packing up their accoutrements and vacating the Zócalo, but not all of them. Some hold-outs remained. 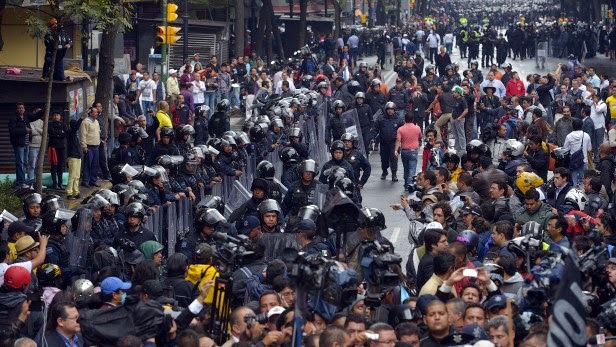 At midday, the Secretary of Interior, Osorio Chung, gave an ultimatum to the remaining teachers to evacuate the square or be removed by force. Still the hold-outs did not move. Elements of the federal riot police began surrounding the square. Helicopters began flying overhead. Then at 14:00 the police moved in. The teachers in the square responded by throwing stones tubing and Molotov cocktails at the advancing ranks. Some set fire to trash and tents. 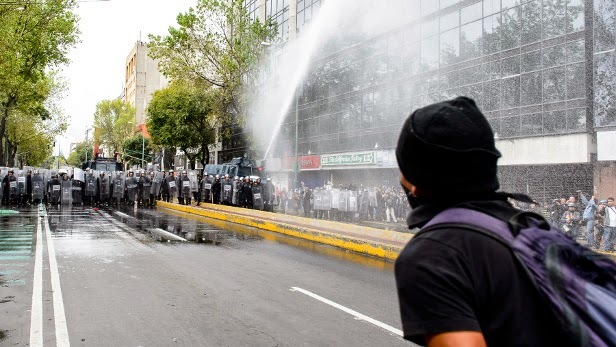 In only five minutes the police had scattered the remaining teachers into the side streets where some protesters, including union leaders were attacked, beaten and arrested. As always there were provocateurs wearing hoods and known as “anarchists” who engaged in the most violent physical confrontations with the police. There were minor injuries on both sides. Over 30 protesters were arrested and later released. The evicted teachers then regrouped and set up their camp in the plaza of the Revolution Monument, which is several blocks away. On Saturday night, September 15th they held their own Independence Celebration with speeches urging resistance in the face of repression. Nor were the teachers alone. Their treatment at the hands of the government aroused sympathy among citizens, unions and university students who contributed their moral and material support, including money, canned food, blankets, water and plastic tarps. 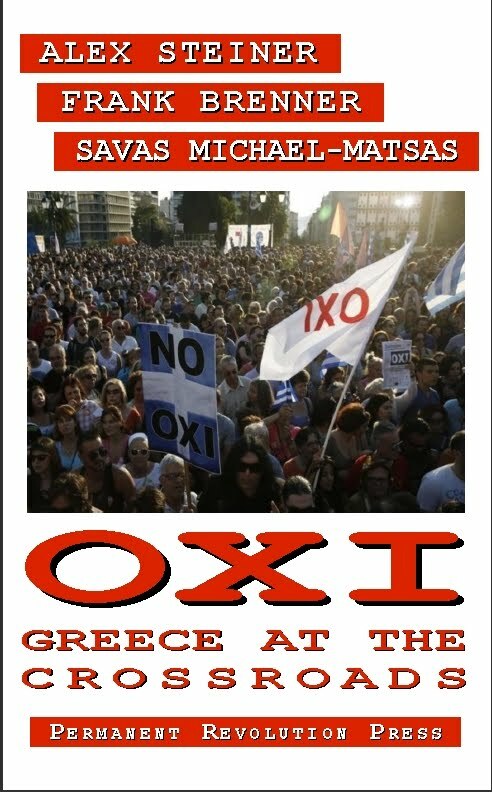 On Sunday, September 16th the teachers in the capital and at least twelve over locations in the country held protest marches. 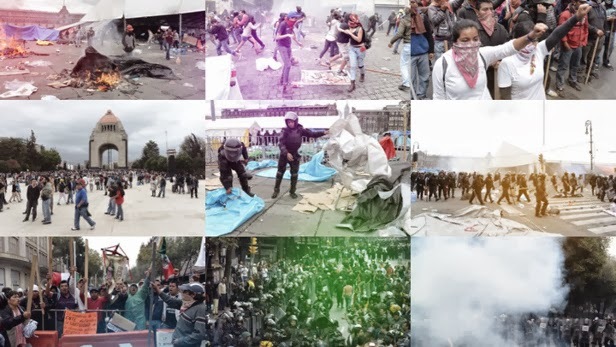 Violent physical confrontations are not uncommon at protest demonstrations in Mexico. The battle for the Zócalo was a test of wills. It was the two sides taking the measure of their opponent. The new president, Peña Nieto, has already shown his readiness to use force to impose his will, in this case the Pact for Mexico, and the Education Reform Law. As of this writing, the teachers are once again deliberating their next move. 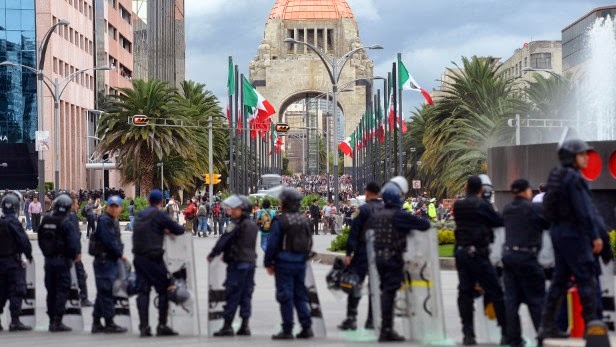 They are debating whether or not to retake the Zócalo later this week, Wednesday or Thursday. 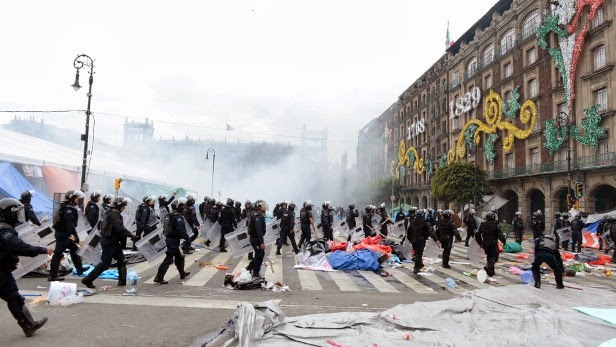 The mayor of the capital, Miguel Angel Mancera, of the leftist Democratic Revolutionary Party, is saying the teachers will not be allowed to reenter the Zócalo. Another alternative is for the teachers to return en masse to Oaxaca and their respective states. Still another is to leave a contingent behind. Many teachers are worried that if they remain absent from work for too long that they will be fired since, according to the very law they are opposing, teachers can now be dismissed if they are absent from work for more than three days. 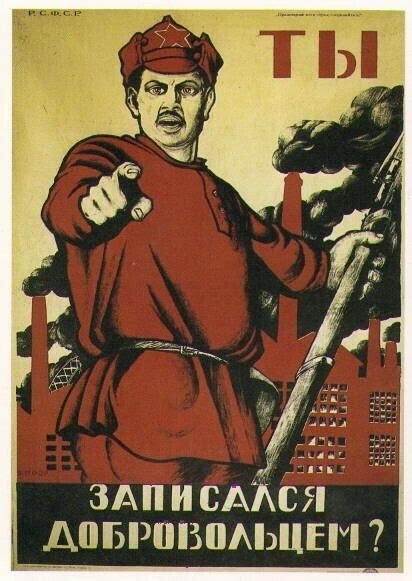 But as one teacher says, we have to fight for our jobs now or later we will have no job to lose. The last alternative is for all the teachers to stay. If all of the teachers stay out on strike the government would have to fire all 73,000 of them.